I'm going to try to keep my personal comments over here in the blog rather than in the text of the web pages, although undoubtedly some opinion will creep in - and probably things that interest me more will get more attention than other items. If there's stuff that should be added over on the main text (like something significant about sports, which I was woefully ignorant about), please let me know and I'll try to work it in. With kids of my own, who both wanted to do some sort of sports, I see how important that is in their lives, and I wish I had tried to be more involved myself (although I was such a klutz, the coaching staff might've been wringing their hands with me). So, 1966-1967. What was it like? I was (and still am) a science nerd, and pretty clumsy (still am), and skinny (not so much any more). I had to take the required English (with Gerry Meyer), Contemporary World (with Al Chanteloup), PE (with "staff", but Mr. Jim Yelton taught me how to tumble, and play badminton, both of which I really enjoyed), French 3 (with Miss Tully - which has come in much more useful over the years than I ever expected), AP Math (Duane Hinders), Photo 50 (with Harry Butterfield). I had done biology the summer before at Gunn (with Bob Anderson and Miss Kenton, plus student teachers Mr. Penny and Ms. McIntosh), so I felt like I had bandwidth to do photography. I was quite surprised at the Photo 50 - three of us that knew each other pretty well had all gotten this "Photo 50" thing on our schedule, and didn't have a clue what it was. We had all signed up for Photo 1, and figured you probably needed to have 1 through 49 before you took 50... but that wasn't the case. Photo 50 was an experiment that Mr. Butterfield wanted to try. It was designed to cover the material from "Photo 1" (theory and technique) but in an accelerated mode. The assignments would be generated from the needs of campus publications, including the Catamount (newspaper), Totem (yearbook), Cub (Student handbook), Folio (literary magazine), and the Palo Alto Times Thursday "High Times" column, which often needed photographs. (Those were worth $5, which was a lot of money in those days). My other two buddies in Photo 50 were Hal Sampson and Charles Scott. Hal has worked in hi-tech in the Sunnyvale area since graduation. Charles (as he now likes to be called - back then it was "Chuck") is an attorney in San Diego, and is actually representing me in a probate issue down there right now. Knowing him gave me the courage to try to work a "conservatorship", with an elderly relative in San Diego. So the old school tie goes on 40+ years later. Photo 50 was the start of my photojournalism gig in high school. We were the trainees, and the trainers were Mr. Butterfield, the Journalism and Yearbook staff, and the current photographers, namely Scott LeGear and John Kehres. Initially we got the easy assignments where you could "take your time", shoot lots of pictures, and present only the best... things like "foreign exchange students"... ("Did you bring some sort of clothing or artifacts from your home country we might use in a picture?"). They would let us tag-along at sports events in case we managed to shoot something useful. It was all great fun. We had deadlines every two weeks, that culminated in the photo staff driving prints down to "the lithographer", where they would produce half-tone negatives needed to print the pictures in the newspaper. There were a lot of wonderful folks in Photo 50 - I remember Linda Mooers, Gretchen Wooding (now a doctor - specializing in allergy in Northern California), Pat Davis, and probably others that aren't coming to mind right now. We were all pretty excited about the prospect of being "published"... and probably all a little nervous as well. I actually did get photographs published (as did many of my colleagues) in a book written about our times at Cubberley: "Hassling", by Sylvia Berry Williams. Sylvia Williams was an English teacher, and she ran the Catamount one of the years I was there. She was a wonderful woman, and very perceptive about much that was going on. To understand Cubberley in depth during those years, I recommend this book highly. One of the photos was of the 67/68 Student Body President, bearded Tim Wise, posing next to a photo of Che Guevarra. 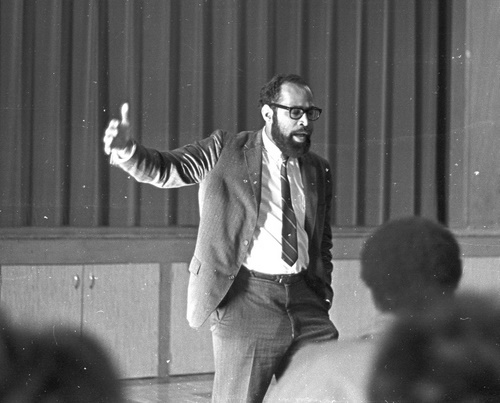 The other was Sidney Walton, the multicultural director in the Palo Alto schools, and later superintendent of Sausalito Schools. Below is a photo of him taken (I think) in early 1969.